April 24 is World Day for Animals in Laboratories, an international day to commemorate the millions of mice, chimpanzees, rats, rabbits, dogs, cats, fish, birds, and other animals tortured in needless experiments. It’s also a day to take action, with rallies and marches held around the world, including this one in Nottingham, England. But even if you are not able to participate in an organized event, there’s still plenty you can do! You can start by asking Air France and ABX Air to stop shipping monkeys for animal research. Just last month, China Southern Airlines ceased its shipments of live primates to laboratories, thanks in large part to public outcry, so these campaigns do work! You can also voice your objection to your tax dollars being used to fund torture. If you live in the United States, tell Congress you don’t want your taxes used to underwrite animal experiments. Every dollar the US government spends must be approved by Congress, and since virtually all federally funded research is paid for with tax revenue, it’s important to let your elected officials know how you feel. You can find the members of Congress representing you, as well as phone numbers and links to contact them online, at http://www.contactingthecongress.org. Animal experimentation is an inherently violent and unethical practice, and you do not want your tax dollars used to support it. In the US, animals also suffer for the “safety” testing of household products, such as cosmetics, cleansers, and even foods for companion animals. Only buy products from companies that don’t test on animals! A comprehensive list is available at http://www.leapingbunny.org. Encourage your friends and family members to support humane companies as well. Let companies currently testing cosmetics on animals know that you will not buy their products until they stop. Most companies have toll-free numbers or websites you can use to contact them. Other campaigns and groups worth checking out include AAVS, Animals Australia, The Bunny Alliance, BUAV, The European Coalition to End Animal Experiments, Humane Research Australia, The Italian Anti-Vivisection Society, NAVS, New England Anti-Vivisection Society, The New Zealand Anti-Vivisection Society, PETA, SAFE New Zealand, and Stop Huntingdon Animal Cruelty. Finally, please consider supporting organizations that rescue animals from labs, such as Beagle Freedom Project and New Life Animal Sanctuary, which I profiled in August 2013. P.S. I devote Chapter 3 of my new book Bleating Hearts to vivisection—it’s a chapter that took me a year to research and write. You can download the book from Amazon, Barnes & Noble, or iTunes, or buy a hardcopy from your local bookstore. With Easter just days away, a lot of parents are thinking of ways to give their children a little holiday joy. Chocolate is a nice treat (at least when it’s not tainted by animal cruelty and child slavery), as are vegan jelly beans. But many well-meaning people think this is the perfect time of year to bring home a rabbit for their kids. Not only is this usually a terrible idea—countless rabbits end up abandoned after children become bored or Mom and Dad discover the animals require as much attention as a dog or cat—but many parents buy a bunny from a pet store rather than adopting from a shelter or rescue group. (Ouch.) It seems parents believe rabbits, children, and Easter are a perfect combination. Rabbit advocate Tracy Martin and friends. A skilled graphic designer, Tracy uses her talents to create vivid ads that are displayed on buses, in newspapers, and on billboards around her Spokane, Washington, community. She’s even done some public-service announcements for television. “I try to reach more people through my Rabbitron Facebook page, as well as taking every opportunity to do radio and TV interviews as they come up to try to reach as many people as possible. 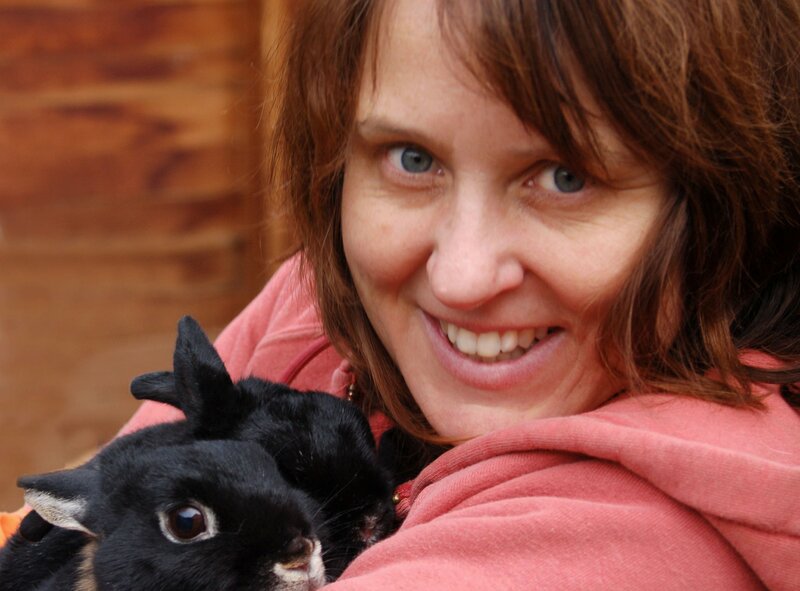 Besides the campaign, I also answer questions about rabbits online and conduct ‘bunny tours’ in my home to show people what it’s like to live with rabbits.” Tracy and her husband not only care for 20 rabbits, they also share their home with pigeons, hens, dogs, and cats. 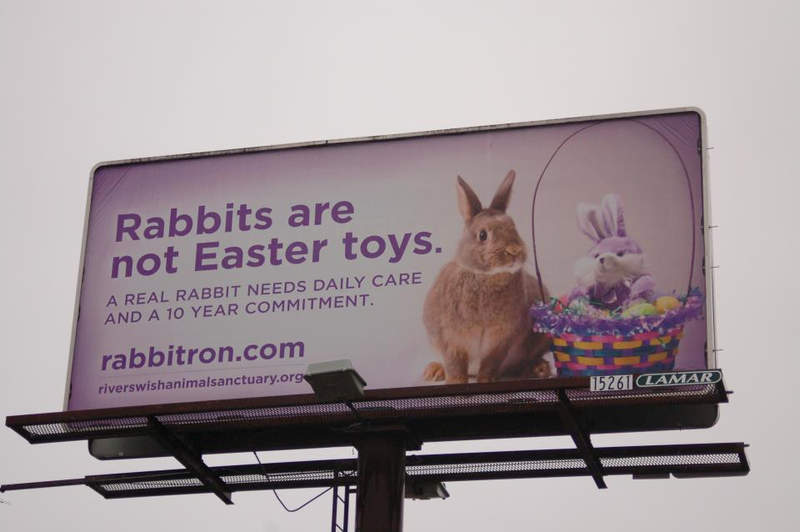 Tracy used to fund the Rabbitron campaign on her own, saving money all year. “In recent years I have been able to get some help with donations from friends and people who want to help,” she says. “Also, after partnering with River’s Wish Animal Sanctuary, we pool our resources to benefit the campaign as well as spread awareness for the sanctuary.” River’s Wish primarily rescues rabbits, though they are also home to horses, chickens, goats, and pigs. The sanctuary adheres to the House Rabbit Society standards and philosophy for rabbit adoptions, which means potential rabbit adopters must first understand the responsibilities involved in living with a house rabbit. For more on why rabbits and Easter don’t mix, visit Rabbitron. You can also follow Tracy on Twitter @RabbitronTracy and like her Facebook page.